Why can’t the dining room be the new family room, a place where the entire family can gather throughout the day? This is what I was saying as I drove back to the house, to take a second look at the dining room when it was in its ugly, no-character stage prior to our work. How would I use the space, I opined? Coffee and news in the morning as I wake up; some breakfast at the cafe table to get me going; work on my laptop at the BDDW dining table, working but feeling like I’m in the park; read my book and enjoy the fog rolling in mid-afternoon; dinner with Sean or friends; a cocktail party in the evening. A room with this view needed to be used! Towards this end, I created a flexible space to accommodate lots of uses. Here’s a quick look at my approach. Provide the tease.A bit of sparkle, reflected in the mirror just off the entry, catches your eye as you enter the house. (this also provides a great space to check your hair while heading out). A neutral color palette of sisal and plaster, with the absence of window treatments, focuses the attention. Draw you in.A David Nash sculpture was used to provide focal point, and a David Maisel large-scale photograph provides the burst of color, the visual interest in the room. Textured glass is used to obscure the view of the neighbor’s kitchen and living room, keeping the focus on the interior, and the views. Textured glass blocks the view to the neighbors kitchen and living room, keeping your attention inside while providing privacy. Photography Mariko Reed. Window to the world.The view is what you are paying for in this house. So, it would be a shame that the dining room is only used for formal dinner. 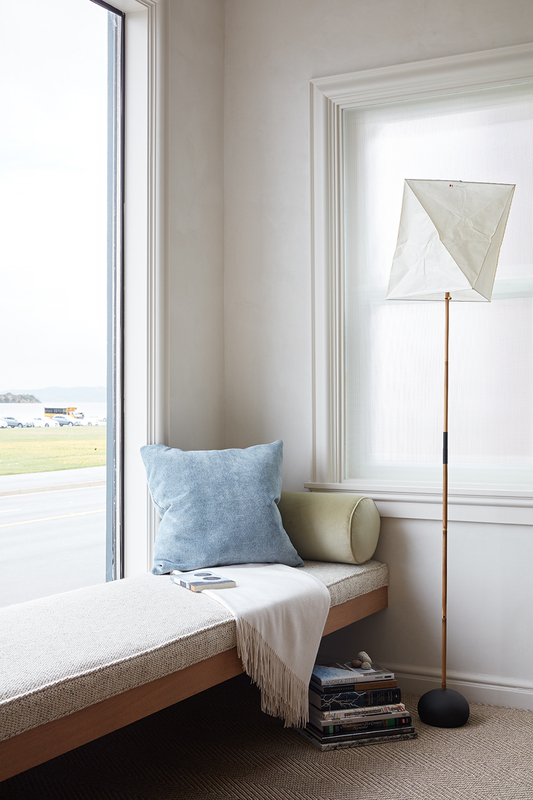 We turned an awkwardly large and low window with a radiator into the perfect place to perch, while keeping kids at least 24” from the sheet of glass. 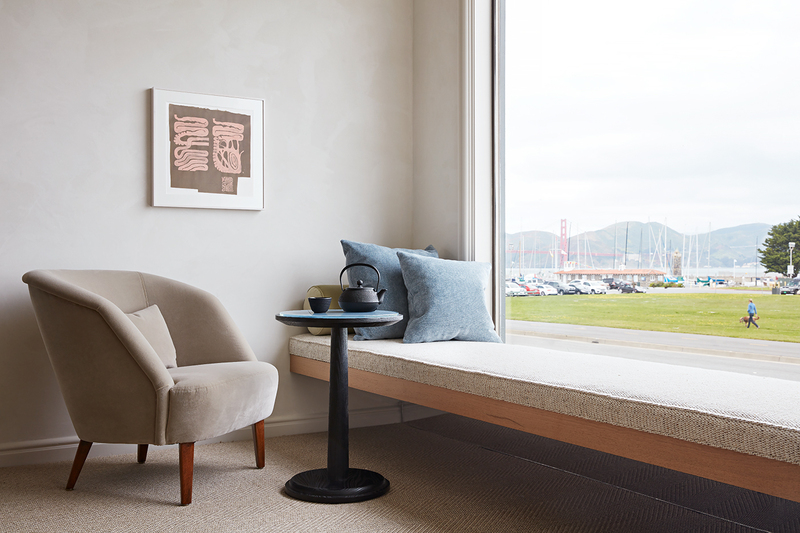 The 13 foot long cantilevered window seat also provides a place to curl up in the morning with the paper and coffee, enjoy the view or work on your laptop. Adding a partner. A comfortable chair provides another advantage to enjoy the view. A great spot for teach or lunch with a friend. Or add several cafe tables, and you’ll have seating for ten at the best view-restaurant in the city. 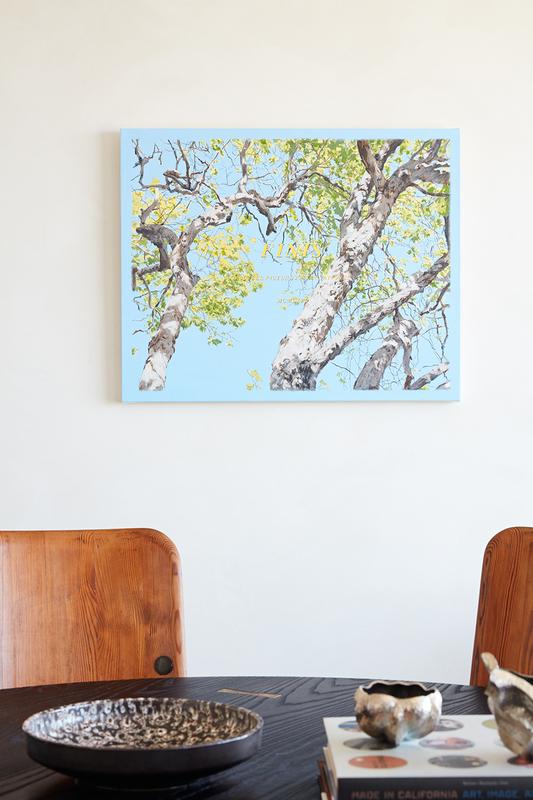 A Julian Hoeber painting pairs with vintage Scandinavian lounge chair, a Bjørn Design custom shou sugi ban (charred wood) and glass table. Photography Mariko Reed. Reward the patient. The longer you stay, the more you see. 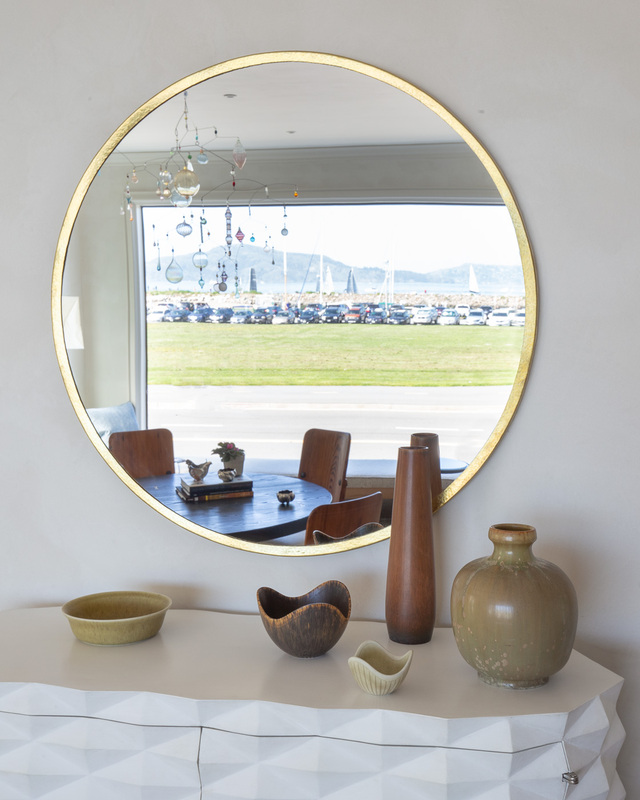 A collection of Bay Area artwork, focusing on alumni of Headlands Center for the Arts, is scattered with contemporary Danish silver, and vintage Scandinavian pottery. 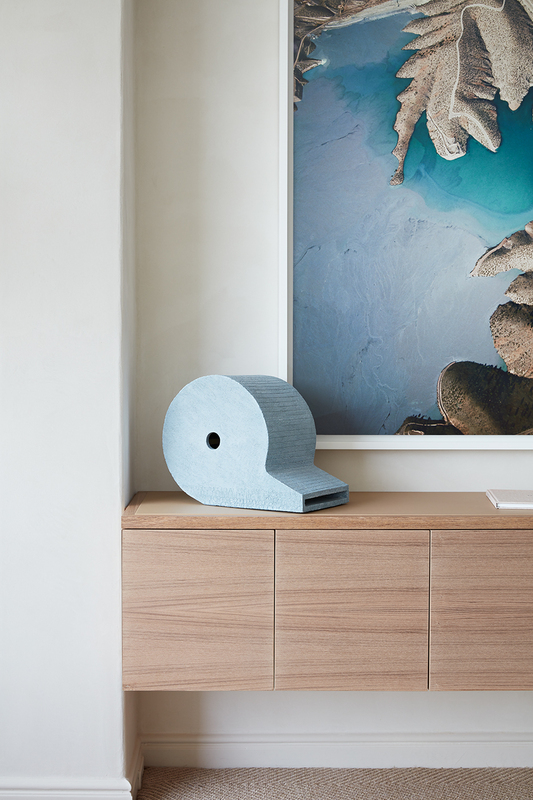 Collectible contemporary and vintage furniture mixes with custom pieces by Bjørn Design. A Luke Butler painting pair with Allan Scharff silver from Gallery 925. 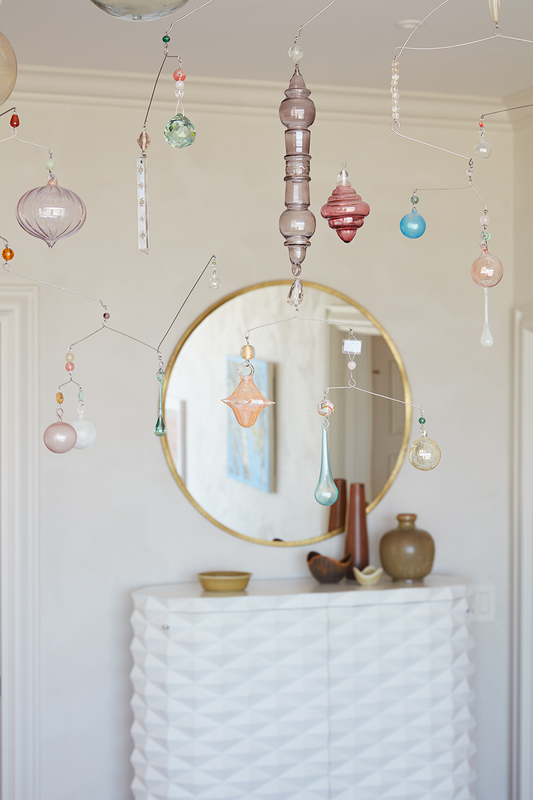 Dare to dream.Why have a traditional chandelier when you can have a dreaming mobile. 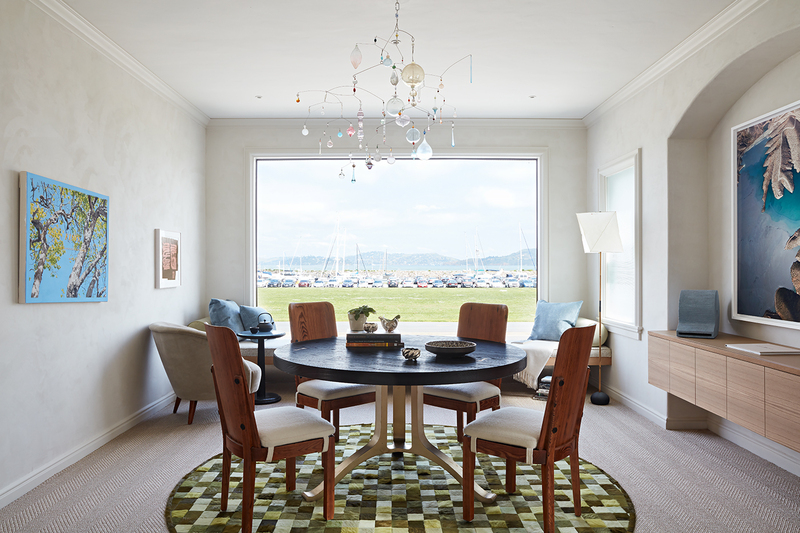 Created from hand painted blown glass, gold, gemstones, coral and crystal, the chandelier allows one’s view of the bay to be uninterrupted, while referencing the masts of ships and found sea glass. Built-ins ad space. This year’s dining room was a small room by showcase standards, and the room basically functioned as a passageway connecting entry to the kitchen and family room. This necessitated using a quarter of the space as a gallery. To maximize the open feeling, a floating, built-in credenza keeps the space light, keeping service to the periphery. A minimal, reductive palette focuses the attention on the view, and accentuates the uniqueness of each object, bringing all into focus. 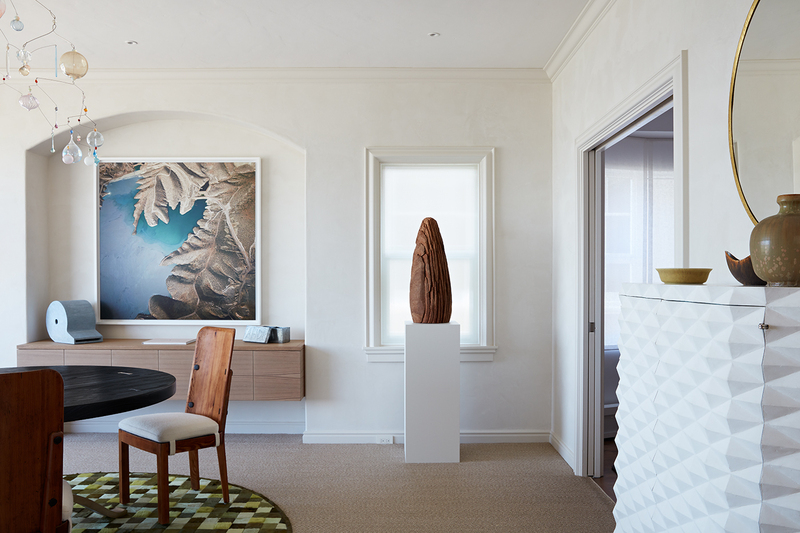 A Ben Peterson sculpture rests on a custom sideboard by Bjørn Design in leather and teak. Photography Mariko Reed.